Go back to the time of the Pharaohs and discover the enchanting pharaonic history the spectacular Sound and Light Show at Giza Pyramids of Cheops, Chefren and Mykerinus. The show starts with the story of the Sphinx who has been the vigilant guardian of the city of the dead for five thousand years..
Egypt Travel representative will pick you up from your hotel to attend the Sound and Light spectacular Show of Giza Pyramids of Cheops, Chefren and Mykerinus. 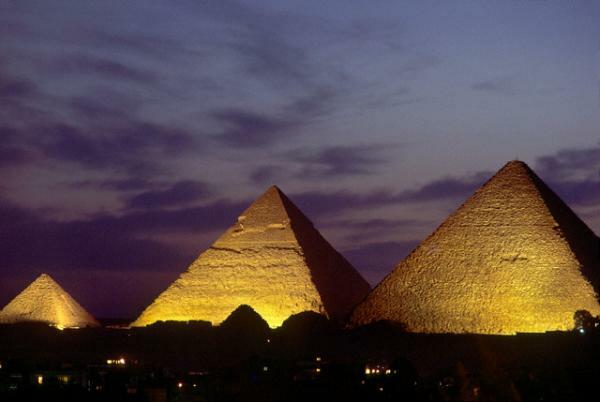 Discover the enchanting history of the ancient Egyptians. The show starts with the story of the Sphinx who has been the vigilant guardian of the city of the dead for five thousand years. The show also depicts the story of building the pyramids and relates the history of great and famous figures of ancient Egypt such as Thutmosis IV, Akhnaten, Nefertiti and Tut Ankh Amon. Back to your hotel. -All languages available via headphones offer translation (English- French- German- Spanish- Italian- Russian- Japanese- Polish-Arabic), translation headsets for free. -Offering free tickets for any tourist group of at least 15 people and hosting the accompanying tour guide. -The tourist whom birthday is on the same day, he'll be offered a free ticket and some sound and light products.